Malcolm Toohey (Joel Edgerton, 'The Great Gatsby') is a committed husband, father and a dedicated detective who’s not afraid to put himself in the line of fire. After surviving a shot through his bullet proof vest during a major drug bust, his Drugs Squad rowdily celebrates their success and Malcolm’s courage at the local pub. Although Malcolm has been drinking, he gets in his car to drive home - and a tragic accident occurs. Shortly after, Jim Melic (Jai Courtney, 'Divergent', 'Terminator: Genisys') and his veteran partner Carl Summer (Tom Wilkinson, 'The Grand Budapest Hotel', 'RocknRolla') are assigned to the case. Jim narrows his focus onto Malcolm as Carl does everything he can to cover up the truth for a fellow cop, putting his own distinguished career on the line. The 'Felony' competition has now closed. Winners will be announced shortly. Competition opens at 5pm AEDT on Sunday 28th December 2014 and closes at 11:59pm AEDT on Sunday 4th January 2015. Five winners will be chosen at random on Monday 5th January 2015. To successfully win, entrants must fulfil the above entry conditions before the time the competition closes. Current members/followers are eligible to enter the competition. Only one entry per person. Only one winner per household. To be a valid winner, the entrant must not have won a prize from SWITCH within the last 28 days. Each winner will receive one Blu-ray copy of 'Felony'. By entering, you agree to receive occasional emails from SWITCH in the future. If you decide to unsubscribe from these updates, any further entries will not be applicable. Only Australian residents are eligible to enter. 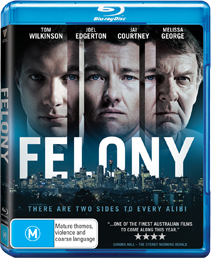 'Felony' is available on Blu-ray, Digital and DVD on Wednesday the 31st December 2014 from Roadshow.